Here are the entries for this month's "Pompeii" challenge! VOTING WILL BE OPEN FROM APRIL 9TH UNTIL APRIL 15. Please choose your favorite entry from the images or links below, then select your choice in the blog poll that will appear on the right sidebar during the days that voting is open. Click on the image mosaic or links below to learn more about each entry and see larger, detailed images of each piece. PLEASE VOTE ONLY ONCE FOR YOUR FAVORITE ENTRY. 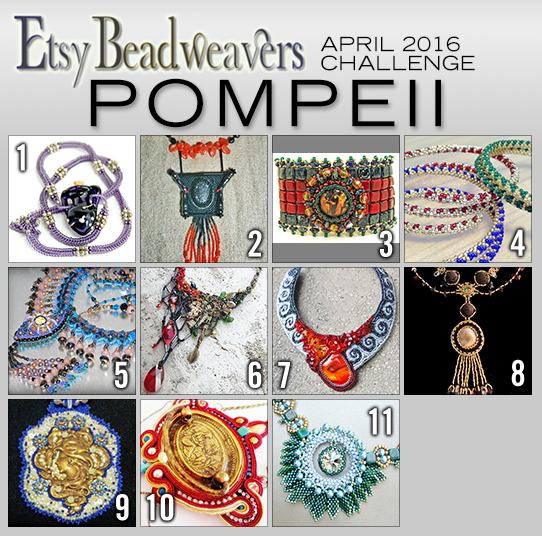 May 2016 Challenge: "The Four Elements"
Etsy Beadweavers is a group of beaders who market their creations on Etsy.com. The Beadweavers' creations are different from many of the traditional beaded items, in that they are woven from hundreds or thousands of tiny beads to create intricate designs and pictures. These weavings take the form of both art and jewelry. Each piece takes many hours to complete, with some larger pieces taking weeks or even months. This blog is devoted to the creations of this group of talented artisans.